Data shows that homeownership rates for people under 35 have dropped by 21 percent since 2004, and this under participation by millennials is causing problems in the housing market. 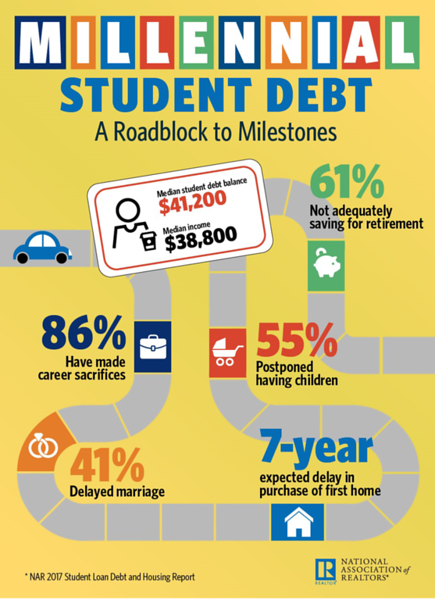 Despite being in their prime home-buying years, a majority of millennials with student debt currently don’t own a home – and many believe this debt is the reason why according to a recent joint study on millennial student loan debt released by the National Association of Realtors®(NAR) and nonprofit American Student Assistance (ASA). According to NAR Chief Economist Lawrence Yun, the housing market’s lifecycle is being disrupted by the $1.4 trillion of student debt U.S. households are currently carrying. In addition to softer demand at the entry-level portion of the market, a quarter of current millennial homeowners said their student debt is preventing them from selling their home to buy a new one, either because it’s too expensive to move and upgrade, or because their loans have impacted their credit for a future mortgage. But while Yun and the NAR, a professional organization incentivized to sell more homes, believe that the normal selling cycle is being disrupted by fewer Millennials becoming homeowners… there are legitimate reasons why young adults are delaying home ownership. NAR and ASA’s study found that 20 percent of millennial respondents currently own a home, and that they’re typically carrying a student debt load ($41,200) that surpasses their annual income ($38,800). Most respondents borrowed money to finance their education at a four-year college (79 percent), and slightly over half (51 percent) are repaying a balance of over $40,000. Further exacerbating this problem, millennials are forced to deal with the realities of negative income trends. According to the Census bureau, even with a full-time job, young adults are earning $2,000 less in real dollars than the same age group made in 1980. 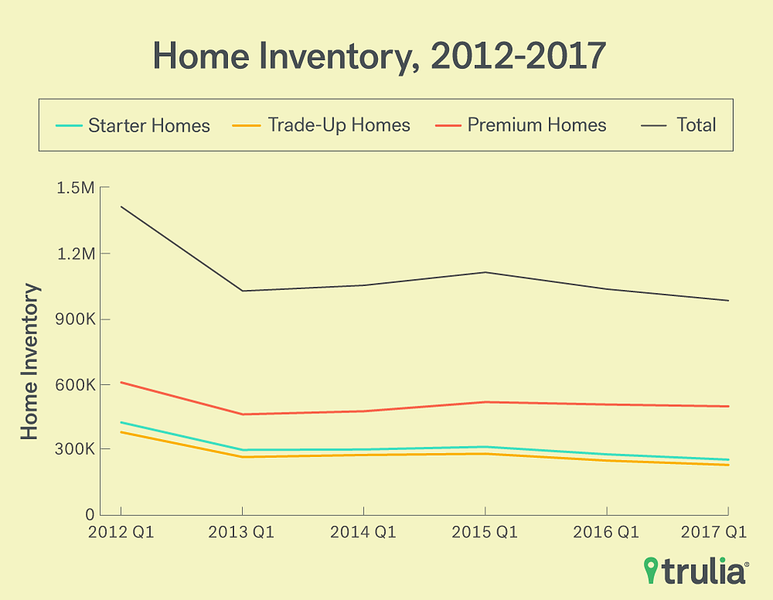 Starter homes are the gateway property for getting first-time buyers into the market, however supply of this market segment is facing disproportional drops in inventory. According to Trulia, homes priced below $200,000 (typical entry-level stock) have experienced an 8.7% year-over-year decrease in inventory levels. The Wall Street Journal notes that entry level home sales only amount for 19% of US home sales, down from 38% in 2011. Affordable rentals also face severe supply challenges. According to Freddie Mac, the US is experiencing an annual shortfall of affordable rental units of about 400,000 units- even when accounting for single-family housing starts. According to a study by Hoyt Advisory Services, the country needs to construct 4.6 million new apartments by 2030. While it will take at least 325,000 new apartments every year to meet demand, just 244,000 units a year were delivered on average from 2012 through 2016. The housing affordability crunch is a difficult problem, effected by multiple factors. Some believe that Millennial home ownership rates are a cause to the crisis, while others believe that lower rates of home ownership among young adults is actually a symptom of a much larger problem. The truth is always somewhere in the middle.